In an age when Giancarlo Stanton gets a 13-year, $325 million contract and Bryce Harper decides a 10-year agreement at $30 million per year isn’t enough, one has to wonder what teams would pay in today’s dollars to acquire the services of a Babe Ruth or Lou Gehrig. Would they be worth $40 million a year? Maybe $50 million? Long before the days of mega-sponsors and television revenues, baseball players (even the really good ones) didn’t make the kind of generational wealth that they do today. In fact, many took off-season jobs to supplement their income. In 1927, fresh off of a record-setting 60 home run season, Babe Ruth was paid an “audacious” sum of $70,000 per year, almost as much as the President of the United States at the time. But in today’s currency, that amounts to about a million dollars a year. Considering the league average in 2018 was just north of $4 million per year, the greatest player in baseball history at his peak was receiving the salary of a marginal major-leaguer in the present. That’s where “barnstorming” came in. Though the American and National Leagues each had eight teams, the furthest west any team was based was St. Louis. That left over half of the continental United States without the ability to attend a major-league baseball game. Babe Ruth’s business manager Christy Walsh (the first professional sports agent) saw a lucrative opportunity to take his home run juggernaut and a group of baseball stars on a coast-to-coast tour, performing exhibitions in cities and small towns that would otherwise never have had that opportunity. The tour consisted of 21 games over three weeks and reached cities such as Providence, Sioux City, Denver and up and down the California coast. With a bonafide superstar like Lou Gehrig earning more money in those three weeks than he made all season with the Yankees, you can imagine the waiting list of players itching to be included on the tour. 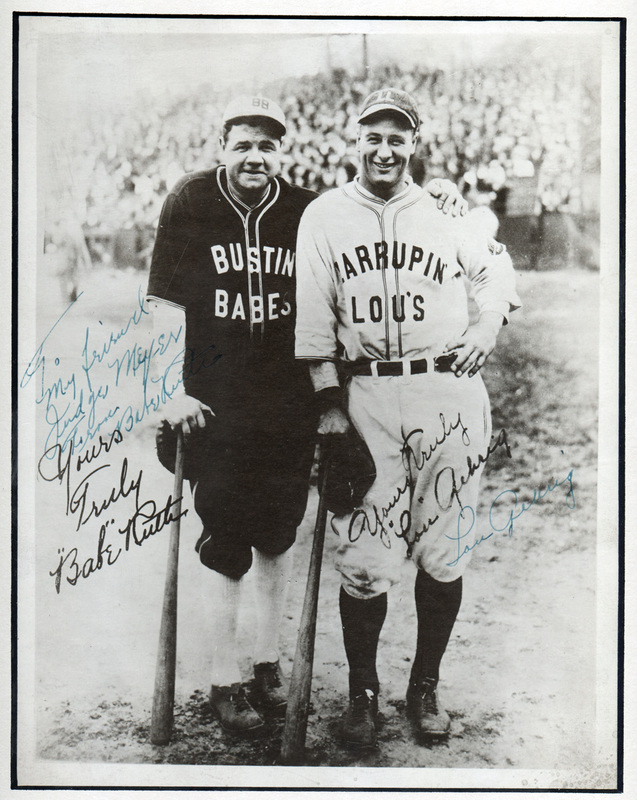 The “Bustin’ Babes” and “Larrupin’ Lou’s” became more popular in the western United States than any team during the season. The barnstorming teams even picked up sponsors along the way, entering “The Mile High City” as “Ruth’s Piggly Wiggly vs. Lou’s Denver Buick.” Ruth’s team won that day 15-8 with “The Bambino” slamming a homer and Gehrig actually taking the mound in the game, though it isn’t known if Ruth’s homer came from a Gehrig pitch. When the players weren’t dazzling spectators, they routinely visited hospitals, orphanages and other locations where kids could meet their heroes and get an autograph of players they only knew of from listening to games on the radio, opening new markets and promoting baseball expansion nationwide to cement the game’s legacy as the greatest American pastime. It’s one of the most famous photos of Babe Ruth and Lou Gehrig ever snapped, made available to fans who attended a game during their three-week exhibition in 1927. Both Yankees legends appear in their opposing uniforms with a facsimile signature of each, but this one has actual autographs as well and is featured in the Mile High Card Company Elite December Auction, which concludes on Thursday, December 6th. Signed by Ruth and Gehrig in green ink as to differentiate from the black colored simulations, the genuine signatures are easy to read with Ruth adding an inscription, “To my friend Judge Meyer.” Matted and framed to a size of 12 1/2″ x 14″ and double authenticated by JSA and PSA/DNA (the latter assessing the signatures as PSA/DNA 9 MINT), it is likely the finest autographed example of Ruth and Gehrig from their legendary barnstorming tour.